Australia's John Eales slotted a penalty in the fourth minute of injury time to earn his side a dramatic 24-23 victory over New Zealand in Wellington. 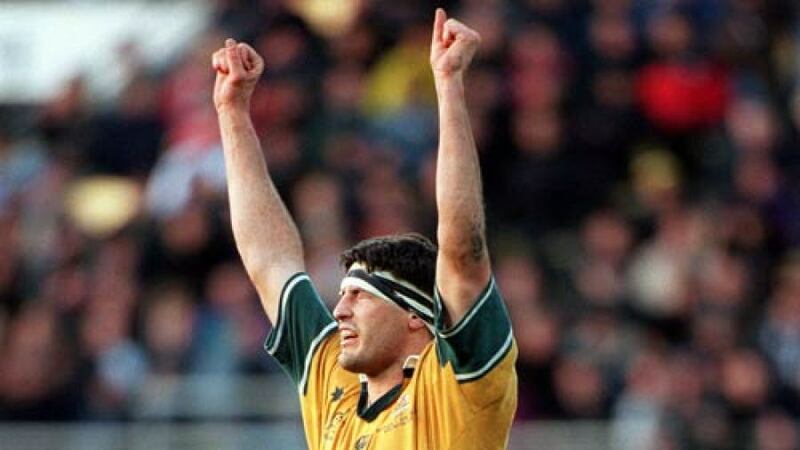 The Wallabies had raced into an early 12-0 lead after tries from Stirling Mortlock and Joe Roff but Christian Cullen replied with a brace to edge the Kiwis into the lead, the legendary fullback equalling the then All Blacks try-scoring record (39) in the process. The game then descended into a straight shootout between Mortlock and Andrew Mehrtens. With New Zealand 23-21 ahead, the latter appeared to have edged that particular battle but, after two dramatic line-out steals and a Stephen Larkham hack upfield, Eales was afforded a chance to win the game for the visitors when they were awarded a rather controversial penalty right on the All Black 22. The World Cup-winning skipper held his nerve superbly to nail the resulting kick and the full-time whistle blew just moments later, leaving the All Blacks both shell-shocked and distraught. National Rugby League star Sonny Bill Williams agreed a move to French side Toulon. The Top 14 club, promoted to France's top flight the previous season, announced they had signed the 23-year-old Bulldogs player in a statement but his proposed move was shrouded in controversy. Toulon were eventually forced to pay a hefty transfer fee for Williams, who had walked out on a lucrative contract in the NRL. He later played two seasons with Toulon before returning to New Zealand with Canterbury in 2010. The Lions edged out Australia 11-10 in the third Test at the Sydney Cricket Ground. The tourists would go on to complete a 3-1 series win by defeating the Wallabies 13-0 at the same venue the following weekend. A late converted try from Mat Rogers saw Australia nick a 20-18 victory over South Africa in Sydney. Mark Gerrard's touchdown had helped the Wallabies into a 10-0 lead at the break but a fantastic Springbok fightback, which featured tries from Jaque Fourie and Percy Montgomery, meant that the hosts were trailing by five points (18-13) as the full-time whistle approached. However, with just under five minutes to go, Phil Waugh put Rogers over in the corner to level matters. Rogers then converted - albeit with the aid of a post - to win it for the Wallabies. After a scoreless first half, New Zealand recorded a hard-fought 5-3 victory in Wellington. The game was notable for the fact that it was played out in hurricane-like conditions. Bevan Wilson landed a last-minute penalty to secure Otago a famous 10-8 win over Australia in Dunedin. New Zealand overcame Australia 24-12 in a one-off Bledisloe Cup clash in Auckland. John Gallagher and Richard Loe scored the All Blacks' tries, with Grant Fox accounting for the remainder of their tally.